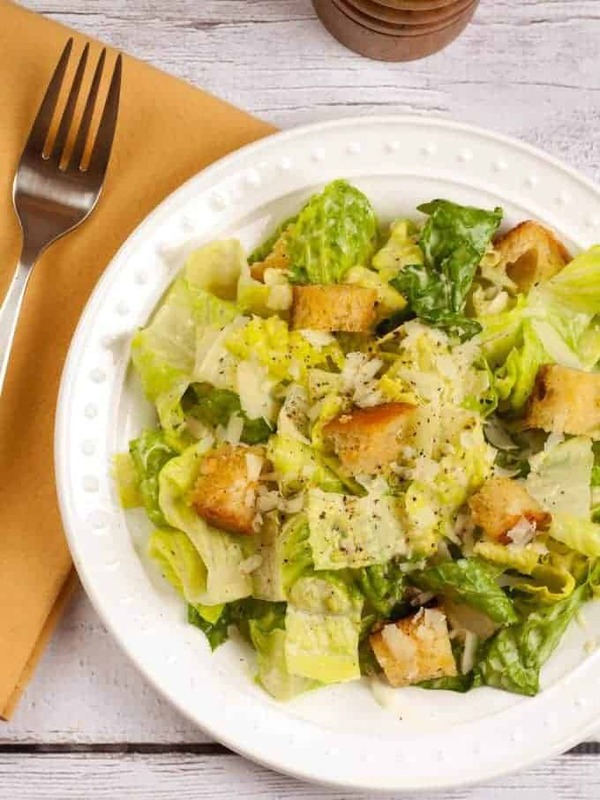 Our Caesar salad recipe is a bit of a departure from the true purist version, but to be perfectly honest, we think it has a lot more flavor. 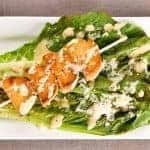 The garlicky croutons are a great addition and the dressing is robustly flavored and easy to make because we’ve substituted mayonnaise and fish sauce for the raw egg and anchovies. 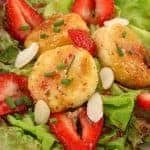 It makes a great first course or side salad, or you can top it with slices of grilled steak, pan-seared chicken or sautéed shrimp to make a complete meal. 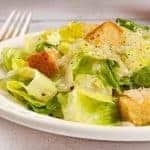 Made with buttery, garlic croutons and an easy version of the classic dressing, our Caesar salad is full of flavor and perfect for serving as a side dish or topped with steak, chicken or shrimp to make a complete meal. Start by making the croutons. Preheat the oven to 225°F and line a small baking sheet with aluminum foil. Heat the butter and olive oil in a large skillet over medium heat. Add the garlic and sauté just until fragrant, 30 seconds (do not brown). Add the bread cubes and toss them with the butter mixture until it’s all been absorbed, about 1 minute. Season with a pinch of salt and transfer the croutons along with the toasty bits of garlic to the prepared baking sheet. Bake until the croutons are crisp on the outside, but still slightly soft on the inside, 7 to 10 minutes. Remove from the oven and set aside to cool. 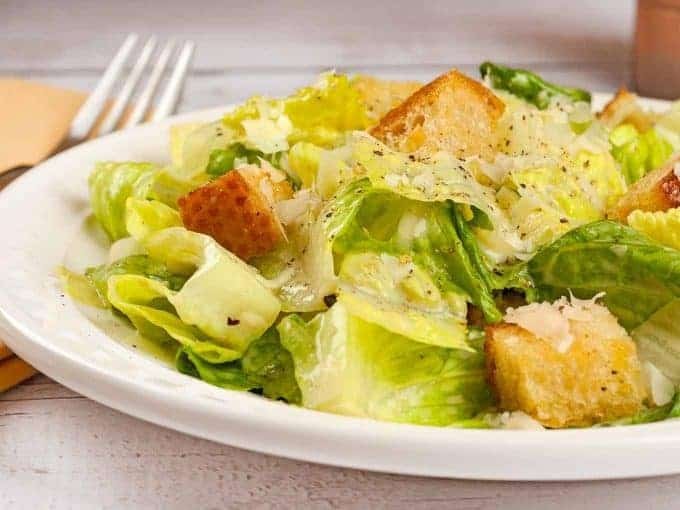 While the croutons bake, prepare the dressing. 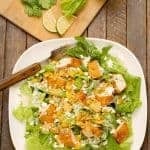 Whisk the olive oil, mayonnaise, lemon juice, 1 teaspoon of the fish sauce, garlic, Worcestershire sauce and mustard together in a small bowl. Taste and add more fish sauce until you’re happy with the flavor. If you feel the dressing is a little too thick add 1 or 2 teaspoons of water to thin it. Set aside. Place the lettuce in a large bowl. Add the dressing and a few grinds of black pepper. Combine thoroughly, then add the grated Parmesan cheese and croutons (including the toasted bits of garlic). Toss again, taste and adjust the seasoning if necessary. 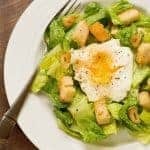 If you don’t want to use mayonnaise in the dressing, use the type of egg substitute that comes in a refrigerated carton. Follow the quantity recommendation for 1 egg. You can also use a pasteurized whole egg if you prefer. You can also replace the fish sauce with 4 jarred or canned anchovies, rinsed, drained and mashed, or 1-1/2 to 2 teaspoons of anchovy paste from a tube.